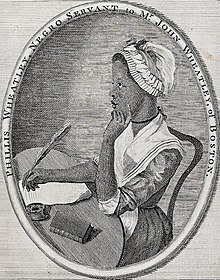 File Meiriceánach ab ea Phillis Wheatley (t. 1753 – 5 Nollaig 1784). An chéad duine Afrai-Mheiriceánach ar foilsíodh a saothar liteartha a bhí inti. Rugadh Whearley timpeall na bliana 1753 san Afraic Thiar. Rinneadh sclábhaí di ina aois a 7 mbliana agus cuireadh go Meiriceá í. I mBostún, Massachusetts, cheannaigh ceannaí darbh ainm John Wheatley í mar shearbhónta dá bhean chéile. San áit agus san am úd ba ghnách sloinne a úinéara a thabhairt ar sclábhaí sa chás go raibh sloinne ag teastáil. Phillis a tugadh uirthi i mBéarla mar tugadh go Meiriceá í i long darbh ainm an Phillis. Thug iníon an teaghlaigh ceachtanna léitheoireachta agus scríbhneoireachta di. Nuair a thuig an teaghlach a chliste agus a bhí sí, tugadh tuilleadh oideachais di. Rinne sí staidéar ar an nGréigis agus Eabhrais. Fuair sí a saoirse ar bhás John Wheatley. Phós sí agus rug sí leanbh. Cuireadh a fear céile, John Peters, i bpríosún de bharr a chuid fiacha. D'éirigh Phillis tinn agus John sa phríosún, agus d'éag sí. Fuair a leanbh bás trí huaire go leith ina dhiaidh sin. Tugadh an leathanach seo cothrom le dáta an 27 Aibreán 2015 ag 04:33.